Again, my CSA Box from Basket of Life Farm on Friday was just chock full of goodness! Lettuce, potatoes, onions, garlic, jalepenos, cucumbers, zucchini, eggplant, patty pan squash, tomatoes, cherry tomatoes and green peppers! I grilled quite a bit this weekend. It was hot enough – I didn’t need the oven heating up the house too! Friday night I grilled a steak with some onions and patty pan squash. I just halved the smaller onions, sliced the patty pan squash into rounds and tossed them with salt, pepper and some olive oil. Then straight onto the grill! 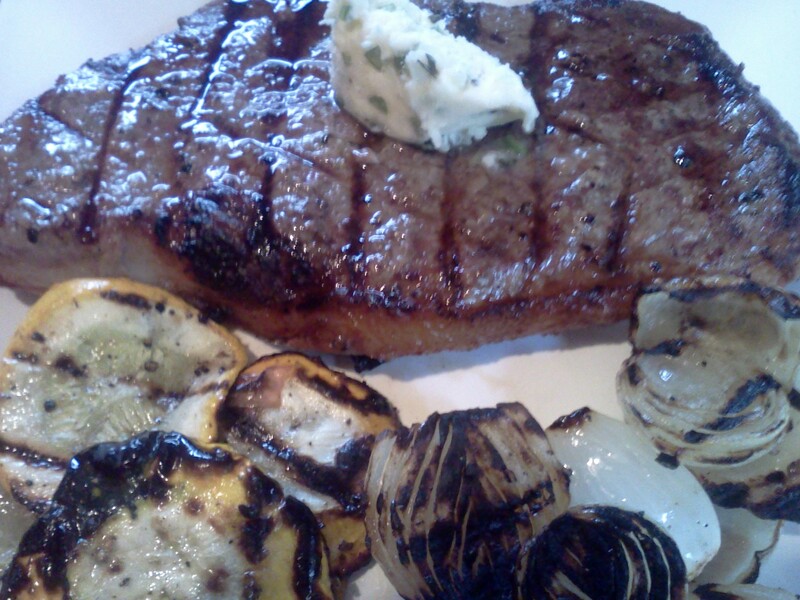 I finished the steak with the last of the garlic scape butter – delicious! The onions I’ve gotten from Basket of Life Farm are so much sweeter than the onions I’m used to, simply grilling them seems to be the best way to take advantage of that flavor. Plus, who doesn’t love a whole dinner with grill marks? Awesome. Sunday, I grilled again for Brian and myself (although I was hungry and forgot to take pictures – sorry!) I grilled chicken breasts (marinated in balsalmic vinegar, olive oil, garlic powder, honey, lime zest/lime juice, salt and pepper) and new potatoes from my CSA – those I wrapped in foil packets with olive oil, salt, pepper and fresh thyme. I tossed the potatoes on the grill and didn’t touch them again for an hour. So easy, and so tasty! I finished off dinner Sunday with a tomato and mozzarella salad using the rest of the CSA tomatoes, and some from our neighbor’s garden that she had just picked. The weather was a little cooler tonight (or maybe just not as humid), so I did some baking. I have to thank Audrienne yet again! She gave me some great zucchini recipes that I was really excited to try. Thanks so much!! You can never have too many zucchini recipes! 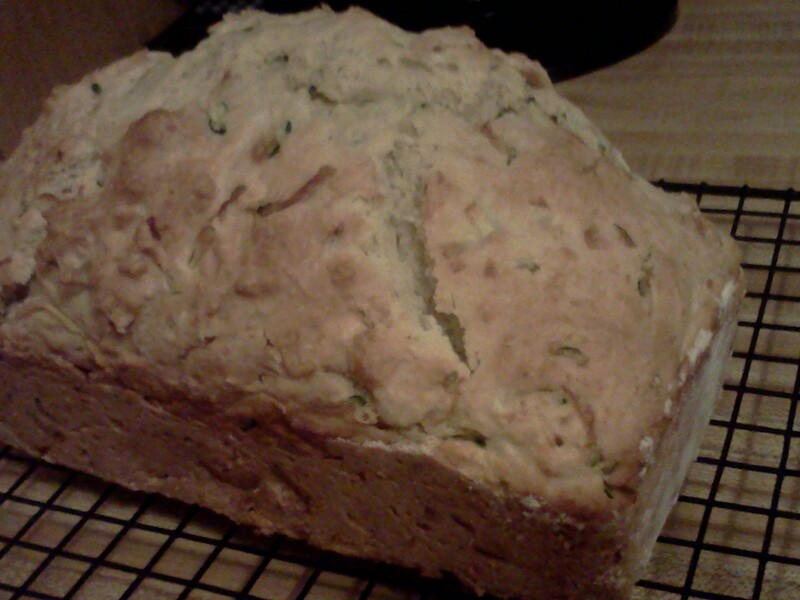 I decided to try the recipe for Zucchini Parmesan Bread. It turned out to be beautiful and yummy! I couldn’t even wait for it to cool – I had to try a piece! 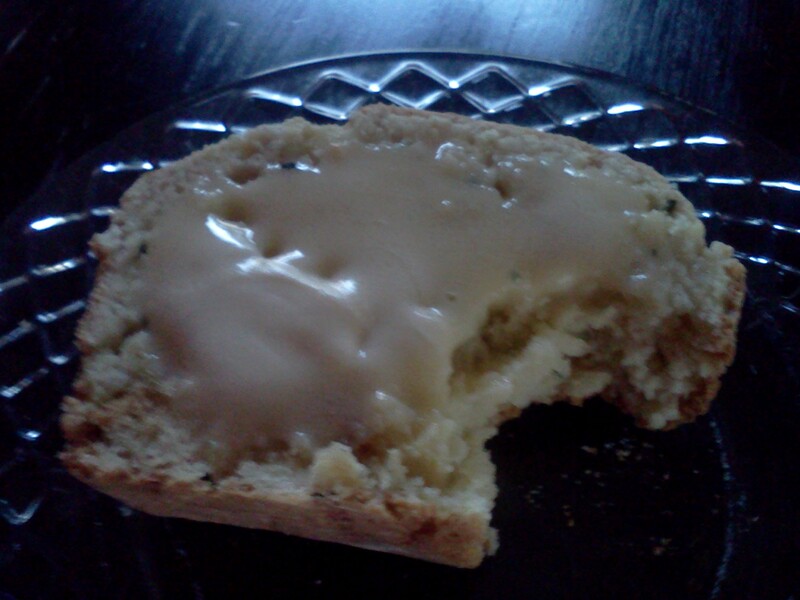 A little butter…yum! Mix flour, zucchini, sugar, cheese, baking soda, salt and baking powder in a large bowl. Set aside. Melt butter and stir into buttermilk. Beat eggs in a medium bowl and stir in buttermilk mixture and onion. Stir into flour mixture – batter will be thick. Spread batter in a greased and floured 9-by-5 inch loaf pan. Bake at 350 degrees for about 1 hour, until a toothpick inserted in center comes out clean. This entry was posted in CSA, Dinner, General, Grilling and tagged Basket of Life Farm, zucchini bread on July 30, 2012 by Melissa. That bread looks so good! I LOVE zucchini bread so much! I am very happy that Nana Drene’s recipe is now available for us to all try! Thanks Melissa, for making it and for sharing the recipe! Since the last zucchini bread I tried was a complete faliure (the whole middle of the loaf collapsed while it was cooking), I was so happy to get this recipe from Audrienne! It will be perfect for breakfast tomorrow! I am not an onion eater but those sweet ones grilled like you’ve done really change my mind. That’s absolutely my favorite way to cook onions. Somehow the grill just mellows out the onionness and makes the sweet onions seem even sweeter! 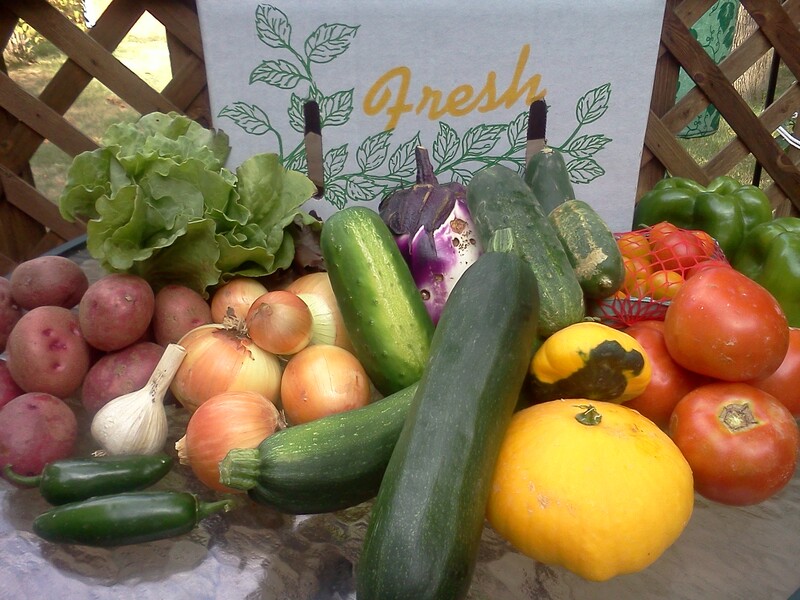 Come and link up to this week’s CSA link party when you get a chance…http://inherchucks.com/2012/07/25/whats-in-the-box-36/. Looking forward to seeing you there! Linked up! I’m so happy to have found another good zucchini recipe. It seems like everytime I think I’ve almost used all my zucchini, another 2 or 3 just seem to appear in the fridge! Crazy! Wow Melissa, you cooked up a storm this weekend. Lucky Brian!! That bread looks so good. I am going to give that one a try too. Sounds a little different then the regular bread recipes. Everything looks great! Thanks! It’s lighter and fluffier than the zucchini bread that I’ve tried to make before. And it makes delicious toast (I found that out this morning).